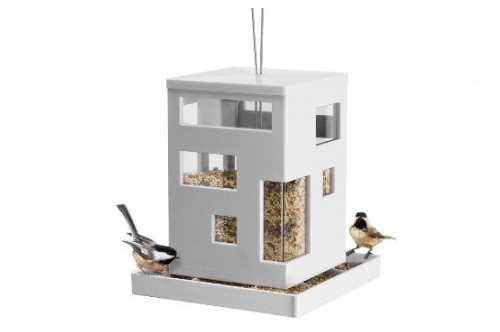 Invite wild birds to dine in style-and satisfy your taste for modern design-with this hip new spin on the traditional bird feeder. The Bird Cafe bird feeder from Umbra features a cube-shaped architectural form with asymmetrical windows and a sleek, white finish. When filled, seed is visible through the clear plastic windows and flows out of holes in the bottom into the wrap-around tray for birds to perch on and feast. Bird Cafe designed by Teddy Luong and Dennis Cheng for Umbra-the worldwide leader in casual, contemporary and affordable design for the home. Price: $28.43 & eligible for FREE Super Saver Shipping.